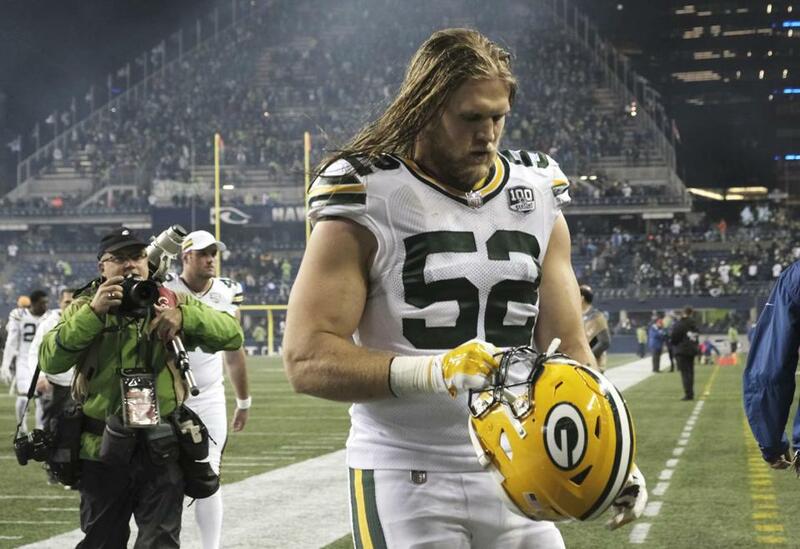 Linebacker Clay Matthews had 83½ career sacks with the Packers, but only 3½ last season. Longtime Green Bay linebacker Clay Matthews agreed to a two-year contract with the Rams on Tuesday. Matthews, 32, had 83½ sacks in his 10 seasons with the Packers, earning six Pro Bowl selections and winning a Super Bowl ring. The free agent has been a standout pass rusher throughout his career, although his 3½ sacks last season were the lowest total of his decade in the NFL . . . The Steelers signed linebacker Mark Barron to a two-year deal and tasked him with filling the void left by Ryan Shazier. The Pro Bowl linebacker’s career is on hiatus while he recovers from a spinal injury suffered in December 2017. Barron was cut by the Rams this month . . . The Panthers signed unrestricted free agent linebacker/defensive end Bruce Irvin to a one-year contract for needed depth at defensive end, where they lost Julius Peppers to retirement . . . The Chiefs signed cornerback Bashaud Breeland to a $2 million contract for their beleaguered defense. Johnny Manziel says he remains confident in his ability to play football ‘‘at any level’’ as the 2012 Heisman Trophy winner attempts another comeback, this time with the Alliance of American Football’s Memphis Express. The former first-round draft pick out of Texas A&M has had stints in the NFL and CFL while dealing with a series of off-field issues. Third baseman Alex Bregman and the Astros agreed to a five-year, $100 million contract extention, MLB.com reported . . . The Brewers, with one of the league’s strongest bullpens, are talking to closer Craig Kimbrel, MLB Network reported. The Brewers split closer duties last season, and Josh Hader, Corey Knebel and Jeremy Jeffress combined for 43 saves. Kimbrel had 42 saves for the Red Sox last season . . . Yankees reliever Dellin Betances has inflammation in his right shoulder and will start the season on the injured list, the team said Tuesday. Betances said he will not throw for three to five days but doesn’t think it’s a long-term issue. Tigers righthander Michael Fulmer may need Tommy John surgery. The team said reconstructive surgery has been recommended following an MRI and a second opinion from Dr. James Andrews. Fulmer, who experienced elbow soreness during a recent bullpen session, will seek a third opinion. Fulmer won AL Rookie of the Year honors in 2016 but has struggled to return to that form . . . Outfielder Carlos Gonzalez signed a minor league contract with the Indians, who did not re-sign All-Star Michael Brantley and traded Edwin Encarnacion in December. Doc Rivers denied rumors he’s interested in leaving the Clippers to coach the Lakers. The LeBron James-led Lakers are 31-39 under coach Luke Walton, whose job status is widely believed to be in jeopardy. Fueling the speculation involving Rivers is that he is close friends with Magic Johnson, Lakers president of basketball operations. ‘‘I have a job and the Lakers have a coach,’’ Rivers said. ‘‘Straight and upfront, I'm going to be here until [owner] Steve [Ballmer] says ‘Get out. '’ ” . . . Memphis Grizzlies guard-forward C.J. Miles is expected to miss the remainder of the season after injuring his left foot over the weekend. Former Auburn assistant coach and 13-year NBA veteran Chuck Person pleaded guilty to a bribery conspiracy charge in the widespread college basketball bribery scandal, ensuring that none of the four coaches charged in the probe will go to trial . . . Saint Joseph’s fired basketball coach Phil Martelli following a third straight losing season (14-19 this season). Ryan Cochran-Siegle won the men’s downhill and Alice Merryweather won the women’s race in the first events at the US Alpine Championships at Sugarloaf Mountain in Maine. Cochran-Siegle, of Starksboro, Vt., and Merryweather, of Hingham, were both members of the US team at the 2018 Olympics and competed on the World Cup circuit this season. The US Alpine Championships continue Wednesday with men’s and women’s super-G races at Sugarloaf, then shift to Waterville Valley in New Hampshire for slalom, giant slalom, and parallel slalom events Saturday through next Tuesday. Alex Ovechkin and the Washington Capitals will get a chance to celebrate their Stanley Cup championship with President Trump at the White House on Monday. The Russian-born captain and playoff MVP and his teammates are continuing the NHL tradition of visiting the sitting president after some recent champions in other leagues have chosen not to. Tsunekazu Takeda is stepping down as the president of the Japanese Olympic Committee amid a vote-buying scandal that French investigators suspect helped Tokyo land next year’s Olympics. Takeda, 71, announced at the committee’s executive board meeting that he will resign when his term ends in June, and he again denied corruption allegations against him. WBC heavyweight champion Deontay Wilder will defend his title May 18 at Barclays Center against mandatory challenger Dominic Breazeale . . . Kenneth To, a swimmer who won a silver medal for Australia at the 2013 world championships, died after becoming ill while training in Florida. He was 26. Obituary, C10.